Brick-and-Mortar Retailers Are Going Extinct! The Number of Retail Store Closures in America This Year Has Exploded Almost 100 Percent! Dying Shopping Malls are Wreaking Havoc on Suburban America! It’s difficult to argue these concerns don’t have merit. After all, in the first half of 2017 alone, a record-setting 3,400 retail stores have closed, a number that brokerage firm Credit Suisse estimates could swell to more than 8,600 by year’s end. (In contrast 2008, currently the worst year on record for retail closures, saw 6,163 stores shut down). Indeed in the retail world, “bankruptcy”, “liquidation” and “vacancy” have become common buzzwords – despite data indicating a much-improved economy and overall fiscally healthy consumer. So what exactly is causing this dramatic shift in the landscape, and are things really as bad as they seem? More importantly, since retail, whose roots date back to ancient times, definitely isn’t going away, what will its future look like? 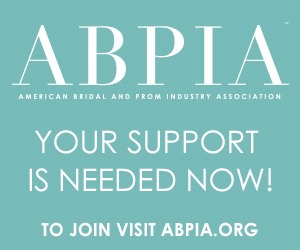 And, of course, the million-dollar question: how will these changes impact independent bridal salons? Before delving into present-day occurrences, it’s helpful to have context. Since retail first burst onto the scene thousands of years ago, when people traded animals such as camels and sheep for basic necessities, it has experienced numerous metamorphoses. Each change no doubt felt shocking to the people and later businesses experiencing it at the time, and absolutely played a role in transforming the overall industry landscape. Some changes were long lasting, others had less impact. In fact, if the history of retail were a song, it could be sung to the tune of Billy Joel’s We Didn’t Start the Fire. Department stores. Shopping malls. The first Wal-Mart. While those lyrics might not ever win a Grammy, the broader point is valid: since its birth retail has always been a dynamic, shifting creature impacted by a variety of factors: social, economic, technological. In fact, some of the most popular words of wisdom business owners like to retweet – “When you’re finished changing, you’re finished!”(Ben Franklin); “It is not the strongest or the most intelligent who will survive but those who can best manage change!” (Charles Darwin) – reiterate this. The fact that in 2017, in a world saturated by innovative technological advances, we’re on the dawn of another retail transformation is hardly surprising. After all, change has always been the name of the retail industry game – and your ability to adapt to it is the key to survival. While it would be great if we could pinpoint a single cause of the so-called Retail Apocalypse (thanks, Amazon!) the reality of the industry’s transformation is more complex. There are a number of compounding factors, some more well know than others. Together, they create the perfect storm that has spelled trouble for a record number of well-known retailers. 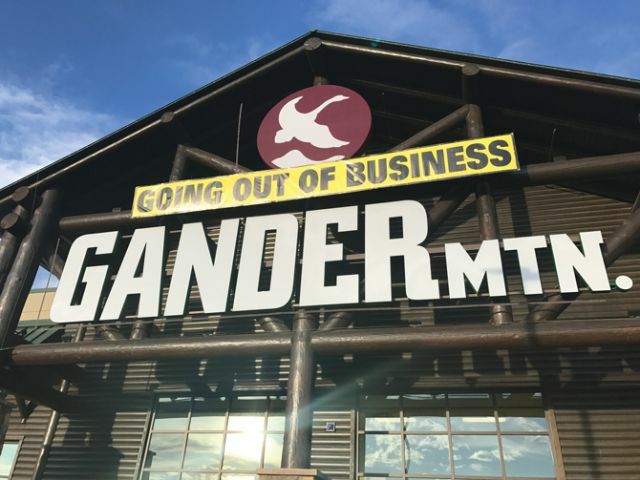 Gordmans, Gander Mountain, the Limited and Bebe are just a few of the big names that have recently filed bankruptcy. Additionally, major chains like Macy’s, JCPenney, Sears and Abercrombie & Fitch are in the process of closing hundreds of stores in attempt to stave off trouble. Many other notable chains frequent trouble watch lists, with analysts all but predicting their impending doom. First up, the familiar culprits. . .
. . .growth of e-commerce. There’s no doubt that the migration of shoppers online is a major contributing factor to Retailpocalypse. In 2017, the National Retail Federation estimates e-commerce in the U.S. will grow 8-12%, a rate that will dwarf brick-and-mortar retail. Although the latter still comprises the majority of sales, it’s expected to grow at a much slower pace: 2.8%. There are many reasons why e-commerce is exploding. Customers like the convenience of being able to shop online 24-7, the speed of ordering something at the click of a button, and the numerous perks they’re being offered like free returns or free shipping. In fact e-commerce has grown so much that nearly a third of consumers say they shop online at least once a week – a 41 percent increase from just two years ago. From a business perspective, e-commerce allows companies to reach a much broader audience, not to mention it’s generally cheaper to operate an e-commerce website than a brick-and-mortar store. Add this to the fact that as technology advances consumers are increasingly being wooed by faster, more reliable ways to purchase and receive items, and it results in explosive growth. …changes in consumer behavior. At the same time the speed and efficiency of e-commerce is improving, there has been a noticeable shift in what consumers desire. Increasingly many people would rather spend money on real-life experiences than material things. This trend is especially prevalent amongst millennials – a prime bridal buying group. In fact, 78% of those aged 18-34 would choose to spend money on a desirable experience or event over buying something desirable, according to a study by Harris Group (1). Furthermore, 72% would like to increase their spending on experiences rather than physical things in the next year. Partially this can be attributed to the Great Recession. During this time, millennials saw material wealth evaporate, which both scared and scarred them. The knowledge that experiences cannot be taken away coupled with millennials’ inherent desire to connect with their community and create relationships helps explain this shift away from acquiring things. Additionally, social media is a factor. Millennials crave recognition and are also fueled by a “fear of missing out”, according to the study. Social-media posts, measured by number of “likes”, allow them the attention they seek and also expose them to all kinds of cool things their friends are doing, which they in turn want to emulate. …too many stores. It’s a double whammy: At a time when there is shrinking demand for brick-and-mortar stores, the U.S. is actually overleveraged in them. In fact, this country has almost 50 percent more retail space per capita than Canada, and five to 10 times more than most other developed countries, according to financial website The Motley Fool. To a certain extent, store closures have been attributed to a natural check-and-balance by economists. It’s a principle played out frequently in the stock and housing markets: What goes up too high must eventually come down until a more even balance is achieved. Next, their less well-known (but still very relevant) cousins. . .
. . .the Hangover. For some retailers, trouble began brewing around 2008 during the Great Recession. Rather than close, however, many struggling stores were able to keep their doors open for two primary reasons: 1) landlords, eager to avoid vacancies, extended lifelines in the form of lower rent or better lease terms; 2) loans were given at historically low interest rates. The problem is. . . not all of these struggling stores were healthy to begin with. And many didn’t make the necessary changes to ensure profitability because they were able to artificially keep their doors open. Now, as leases expire and debt comes due, it’s time to pay the piper – only some companies aren’t in the position to do so. …private equity problems. A common theme in many retail bankruptcies? Private equity. Half the retailers filing for Chapter 11 this year are owned at least in part by private equity, according to CNBC. The network also points out that Moody’s has a number of other retailers owned at least in part by private equity on watch lists based on upcoming debt maturities, including J. Crew, Neiman Marcus, rue21, Claire’s and Charming Charlie. Without delving deeply into the financials, here’s the problem in nutshell: private-equity firms have burdened companies with crushing debt loads at a time when their ability to pay it off has weakened. Furthermore because of this debt, struggling companies were unable to invest as heavily in e-commerce or other areas of the business necessary to remain competitive, putting them further behind. …major bankruptcy code changes. In late 2005, the bankruptcy code shifted from largely debtor-friendly to creditor-friendly due to successful lobbying attempts on behalf of creditors and retail landlords, according to an analysis published by CNBC. The bottom line: A struggling business now has much less time to turn things around after filing Chapter 11 bankruptcy. Previously retailers might be in bankruptcy for 18 months or so; today the law gives them a maximum of 210 days to inform landlords if they’re going to renew leases or close doors, according to the analysis. This ultimately has a dramatic impact on struggling retailers’ ability to reorganize. As a result, liquidations and bankruptcies have skyrocketed, further compounding the problem. There is not one single factor contributing to retail’s shift, but rather a multitude of changes colliding at once. Indeed, retail is finally seeing the effects of a dramatic, major shift that had been quietly simmering under the surface for many years. With all the talk about retail’s struggles, it’s tempting to get discouraged when thinking about the industry’s future. That, however, would be an overreaction. Brick-and-mortar retail is NOT dead, although stores that fail to adapt to the changing times might be. Simply put, it’s evolving – like it has many times in the past. Today, it’s easier than ever for consumers to buy commodities online. And when people buy commodities price – and to a lesser extent convenience – becomes the major differentiating factor. There is only room for so much of that. As such, a store can no longer survive by being just a place to sell merchandise; to compete in the so-called “Age of Amazon” you must give consumers a compelling reason to visit your store. Experts call it “Experiential Retail” – essentially, the act of providing hands-on, authentic experiences and special amenities that engage customers. After all, people might buy commodities online but they will still go to a brick-and-mortar location to have an experience (See sidebar: 4 Retailers Who Are Doing It Right). In this way independent bridal salons are lucky; they’re better positioned than many retailers to deal with these changes because they’ve always focused on providing an exceptional customer experience. 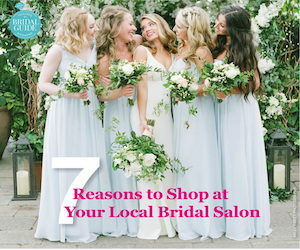 The savvy bridal salon owner knows that everything from the elegance of her salon’s dressing rooms, to the friendliness and knowledge of her staff, to the creative gifts with purchase, to the handwritten thank you card sent several days after an appointment all contribute to a bride feeling special, like a princess. And, with few exceptions, this princess treatment is exactly what brides are looking for. This will never change; in fact the importance of this first-class treatment will only heighten with time, becoming a bigger differentiating factor between the retail haves and have-nots. The bridal store of the future must double down on offering personalized service and authentic experiences while at the same time investing in technology to complement its brick-and-mortar location. This is how you keep a brand relevant: combining the best of both worlds. What technology means to different industries will vary but ultimately experts predict most retail stores will settle into a model called “omnichannel” selling. Simply put, this means the majority of consumers will come to your store to enjoy the shopping experience without actually buying anything on the spot. Think showrooming on a grand scale: they might spend the day learning about different dress styles, trying on gowns in a luxurious fitting area and sipping chilled champagne but many won’t actually buy their dress until they’re back home sitting in front of their computer in their pajamas. At the very least, shoppers will expect the option to do so. Your job is to engage them to the point where they demonstrate brand loyalty – something, studies say, is actually more likely to occur after a pleasant in-store experience. Future successful brick-and-mortar stores will essentially kick-start the sale, which could not occur without their presence. E-commerce is much too impersonal to thrive alone. Even Amazon knows this; in fact the online giant has been experimenting with physical stores since 2015. A brick-and-mortar location is a crucial complement to a successful retail formula, and moving forward its main goal will be to “sell” the brand to customers through memorable experiences, keeping that brand top-of-mind even after a person leaves the store. The future of retail, therefore, is not brick-and-mortar OR e-commerce, it’s brick-and-mortar AND e-commerce. One cannot exist without the other, and while the physical store will remain the heart and soul of a bridal business, technology will be the heartbeat that allows the entire entity to thrive. Athleta – the women’s fitness apparel company owned by Gap, Inc. doesn’t just sell trendy “athleisure” wear. . . it offers its fitness-minded customers a variety of in-store classes and other events where these clothes can be put to good use! Toms – the shoe and accessories company, known for its “One for One” slogan that means every product purchased helps a person in need – features brick-and-mortar locations that serve the community as well as the customer. For example, its Austin, Texas, location – a hip bungalow reflective of the local vibe – once gave a week of clean water to someone in need for every bag of coffee purchased at its café. Bridal lesson: Giving back is an easy way to help customers feel good about shopping with you. The bonus: millennials in particular love companies who are attached to a broader cause. Sephora – the international beauty retailer hosts regular make-up workshops, offers trend tutorials, and generally aims to make the shopping experience seamless. For example, in-store customers can experiment with various makeup products for sale and their mobile app allows customers to “try on” various shades of lipstick. Bridal lesson: Offer a top-notch experience both online and in-store. No matter where your customer is, you need to be able to reach her. That message should be consistent. Walking into a Sephora store is like attending a make-up party, with aisles and aisles of colorful product to try out. Samsung – in 2016, the electronics company opened a 40,000-square-foot retail center in the heart of New York City called Samsung 837. Dubbed the “digital playground” and a “marketing center of excellence”, products aren’t sold here. Instead concierge employees are available to help customers with their Samsung devices, and patrons can enjoy a variety of features including Oscar-nominated movie screenings, live DJs, a virtual reality tunnel, cooking workshops, and a family-friendly playroom – all integrating the latest Samsung products, of course! Bridal lesson: If you entertain them, they will come. And anytime you can show, not tell, a customer how your products will enhance her life, that’s even better!